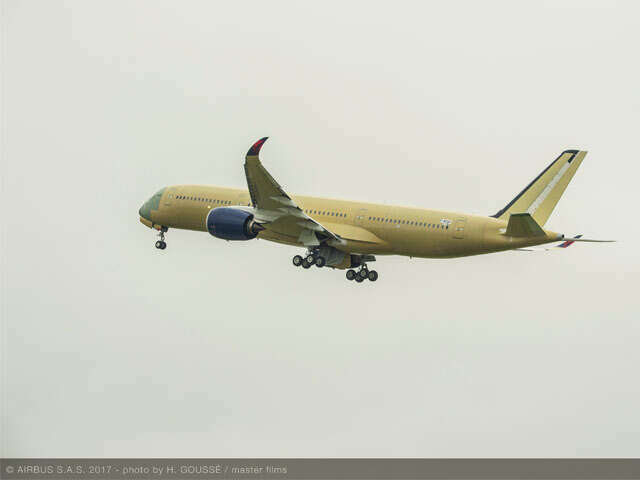 Delta’s first Airbus A350-900 took to the skies, kicking off two months of flight testing. Delta’s first Airbus A350-900 — yet to be painted in Delta’s signature livery — took to the skies early Tuesday morning in Toulouse, France, where the aircraft is assembled, kicking off two months of flight testing, and a fresh paint job, prior to delivery to the airline mid-summer. ​The lightweight, composite widebody aircraft will be the first of the state-of-the-art jets to be delivered to a U.S. airline and is expected to begin service in October on primarily transpacific routes. The aircraft began taking shape back in January as it entered Airbus’ final assembly facility. The A350 will be Delta’s flagship international aircraft and the first to feature the airline’s all-new Delta One Suite, the world’s first business class cabin to feature a sliding door, as well as Delta Premium Select, a new premium economy experience. In all, the A350 will feature 32 seats in the Delta One cabin, 48 seats in Delta Premium Select and 226 seats in the Main Cabin. Customers in all cabins of service will have access to high-speed 2Ku Wi-Fi internet access offering consistent, uninterrupted, gate-to-gate coverage anywhere in the world with speeds that allow customers the ability to stream video and use work-related networks such as VPN. A modern cabin environment will also be outfitted on Delta’s A350 with high capacity overhead bins, full spectrum LED ambient lighting and in-seat in-flight entertainment at every seat. The fuel-efficient jets will replace retiring widebody aircraft. Delta will take delivery of five A350s in 2017 with more coming in 2018.